Inventory We are a resale marketplace, not a box office or venue. Ticket prices may exceed face value. This site is not owned by Molson Canadian Amphitheatre . The Molson Amphitheatre is the premier outdoor concert venue in Toronto, Ontario, Canada. The Molson Canadian Amphitheatre was built in 1970-1971 and expanded in 1995 to be a semi-enclosed outdoor venue. 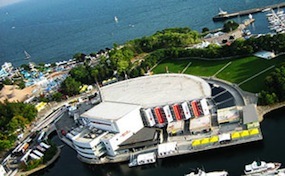 The Molson Amphitheatre box office is located on 909 Lake Shore Boulevard W on the grounds of Ontario Place. Famous Canadian Brian Adams was the first musical guest to perform at the Amphitheatre that can now seat 5,500 under the covered roof, 3,500 under the open air, and 7,000 on the grass lawn. The Molson Amphitheatre tickets have been purchased by more than 3 million visitors. The venue provides some of the best video screens located flanking the stage and the rear of the covered roof. The amphitheatre was one of the first attractions at Ontario Place. Originally the canopy was vinyl and made to be taken down during the off season, but was later replaced with a permanent copper structure and the venue now hosts concerts year round. The future of the amphitheatre is in the air right now as owners are decided whether to replace it with an enclosed venue or renovate the existing facility. Molson.AmphitheatreToronto.com is an independently owned and operated company that proudly offers access to a wide array and low prices for all secondary market inventory. We are not associated with any official box office, website, or primary supplier at this time. Prices may be below or above face value and are subject to change at anytime. To order your tickets for any Molson Amphitheatre event simply click on the performance of interest or pick up your phone and call our operators at anytime.